Vendor/Sponsor Registration - Retail Warehouse Sale 2019 - Feb 15, 2019 to Feb 16, 2019 - Oak Park-River Forest Chamber of Commerce, IL ? *Vendor booths for this event are FULL* There is no waitlist. Please consider attending as a guest. Visit Retail Warehouse event homepage for general event information. 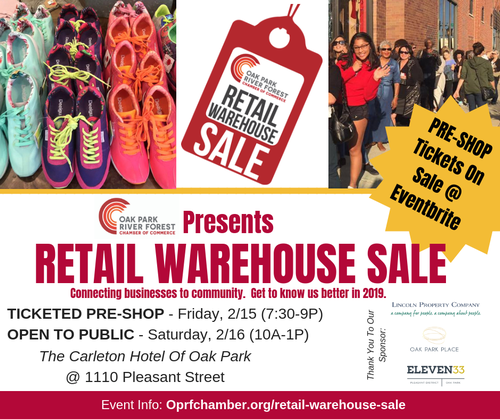 The 2nd Annual Retail Warehouse Sale on FRIDAY, FEBRUARY 15, 7:30-9P (ticketed pre-shop) & SATURDAY, FEBRUARY 16, 11A-2P (open to the public) at The Carleton Hotel Of Oak Park, will feature top area retailers selling end of season stock in an exciting event open to the public. Deals abound, retailers rejoice and the public goes nuts. Why Be A Vendor? It's EXCELLENT MARKETING. Retail businesses come face-to-face with hundreds of enthusiastic shoppers who may be new to your business. The Chamber markets this event to 40k+, via e-blasts, web postings, PR, social media, print advertising and more. Vendors KEEP 100% OF SALES and convert old INVENTORY INTO CASH. It's GREAT NETWORKING. 20+ retail-related businesses, their owners + managers will be present. Your booth neighbor could be your next collaborator. It's AFFORDABLE. The OPRF Chamber charges members $150 to participate. Non-members pay $400. Vendor FAQs HERE. Click green "Register Now" button above to register as a vendor. SET-UP Friday, 2/15, 4-7:30P, BREAKDOWN Saturday, 2/16, 1-2P. Vendors must NOT BREAKDOWN before 1P. Vendors pay one BOOTH FEE to participate ($150 members, $400 non-members) in 2/15 + 2/16 events. Spaces are limited + will fill. Chamber provides ~10' x 10' booth space + complimentary SHOWCASE TABLE (6'-8') + two chairs. 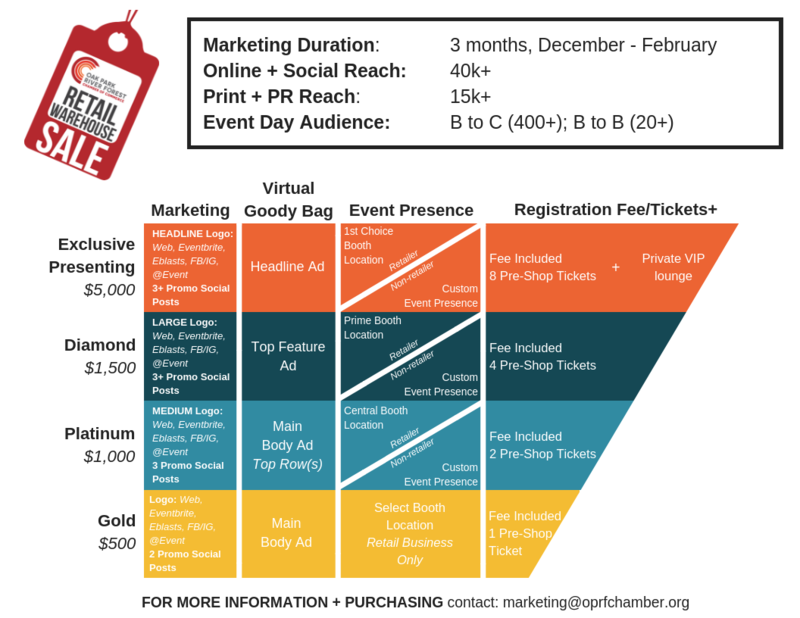 Chamber will conduct EXTENSIVE online, social media + offline event MARKETING for sale events. Vendors HELP PROMOTE event via e-blasts, social media, etc. + provide $25+ gift card for day-of raffle. Vendors TRANSACT OWN SALES via mobile POS/hotspot, keeping 100% of proceeds. Wifi available, but may be spotty due to heavy usage. Vendors must provide discounts consistent with a warehouse sale, minimum of 20% off retail, ideally much more. Chamber will invite vendors to a "Boost Your Booth" networking + pre-party on 2/6 PM @ Riveredge Hospital. Vendors (+ attendees) will have access to FREE PARKING in designated Carleton Hotel parking lots. VIRTUAL GOODY BAG ? The Chamber will email a virtual goody bag filled with offers to 500+ attendees post-event. Ads start at $25. View sample goody bag HERE. BUY A DOUBLE BOOTH ? Need more than one booth? No problem. Please register TWICE. One booth per registration. Booth must be registered under name of business selling goods. If 2nd business is different than 1st, and not a member, it must pay non-member booth fee ($400). To REGISTER + PURCHASE Add-Ons, click green "Register Now" button above or contact us. Vendor booths are SOLD OUT. Please no MLM or direct sellers @ this event.